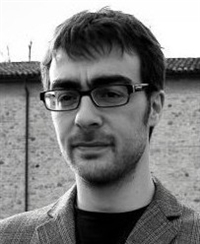 Gabriele D’Avino received a PhD in Materials Science at the University of Parma (Italy) withProf. Anna Painelli in 2010, with a thesis entitled “Cooperativity from charge transfer, phonons and electrostatic interactions in functional molecular materials”. He then joined the group of Prof. Claudio Zannoni at the University of Bologna (Italy) for athree-year postdoc focused on the multiscale modelling of organic semiconductors and their interfaces, for electronic and photovoltaic applications. In October 2013 he moved to the Nanomaterials group led by Matthieu Verstraete at the University of Liège(Belgium) with the support of a Marie Curie BEIPD-COFUND fellowship. There he conducted an independent research project “Theoretical Investigations of Multifunctional Molecular Materials”, combining Density Functional Theory and model Hamiltonians to study ferroelectricity and magnetism(multiferroicity) in molecular charge-transfer complexes. Since January 2015 Gabrieleis Marie Curie IEF Fellow in the Laboratory for Chemistry of Novel Materials atthe University of Mons. His research project “Bridging length and timescales of Electronic processes in organic Semiconduc Tor devices”(BEST) is aimed at the development of a multiscale modelling platform for opto-electronic devices based on organic semiconductors. G. D’Avino, M.J. Verstraete, AreHydrogen-Bonded Charge Transfer Crystals Room Temperature Ferroelectrics?, PhysicalReview Letters 113, 237602 (2014). Chemical Theory and Computation, 10,4959 (2014). G. D’Avino, S. Mothy, L. Muccioli, C.Zannoni, L. Wang, J. Cornil, D. Beljonne and F. Castet, Energetics ofElectron-Hole Separation at P3HT/PCBM Heterojunctions, J. Phys. Chem. C 117,12981 (2013). J. Cornil, S. Verlaak, N. Martinelli, A.Mityashin, Y. Olivier, T. Van Regemorter, G. D’Avino, L. Muccioli, C. Zannoni,F. Castet, D. Beljonne, P. Heremans, Exploring the energy landscape of the charge transport levels in organic semiconductors at the molecular scale,Accounts of Chemical Research 46, 434 (2013). L. Muccioli, G. D’Avino, C. Zannoni,Simulation of vapor-phase deposition and growth of a thin film of pentacene on C60(001), Advanced Materials 23, 453 (2011).